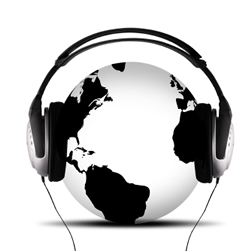 Home Streaming Music What is Streaming Music? Streaming Music is a system of delivering an audio signal to your PC over the Internet, and differs from the "normal" method of receiving Internet audio in one important way, instead of having to download a ".mp3", ".au" or other type of file completely before being able to listen to it, you hear the sound as it arrives at your PC, and therefore do not have to wait for a complete download. As the data arrives it is buffered for a few seconds and then playback after streaming. As the Music is playing, more data is constantly streaming, and as long as you are receiving a constant stream of data, you should hear constant audio. You’ll need a soundcard, speakers and the appropriate software for this all to work. Similarly, as long as there is data in the buffer, you will continue to hear sound. Unfortunately the buffer can empty due to congestion on the Internet which may stop you from receiving data, this explains the "net congestion - rebuffering" message you may see from time to time with the RealAudio software. It Depending on the station, it will probably use one of the 2 major formats currently available: RealAudio or Windows Media Player. A growing number of stations are using streaming MP3 format and Winamp/jet audio can be used to play these. However, if you don't have it you can configure RealPlayer to play MP3 streams. You will need Winamp though to play Ogg streams as neither Windows Media Player nor RealPlayer can handle these (you'll need the Winamp Ogg plugin). Alternatively you can download Paul Quinn's QCD CD player, which has the ability to play Ogg streams built into it, and saves a LOT of hassle downloading the plugin for Winamp. It’ll also play your CDs. There is another delivery method: -- Abacast. It uses Windows Media Player and redundant bandwidth.